First, apologies for the crayon, but I hope to make a point. Several recent power outages have each led to a nearly complete loss of service to the B-division of the New York City Subway. Even on a day-to-day basis, the subway is scourged by inconsistent service and crowded trains. The MTA is using this recent publicity to push for upgrading the subway’s signal infrastructure, making that very expensive and long-term solution seem like the way forward. While signal upgrades have merit, there is a much simpler way to avoid propagated delays in the subway: de-interlining, or as Alon Levy puts it, eliminating reverse branching. 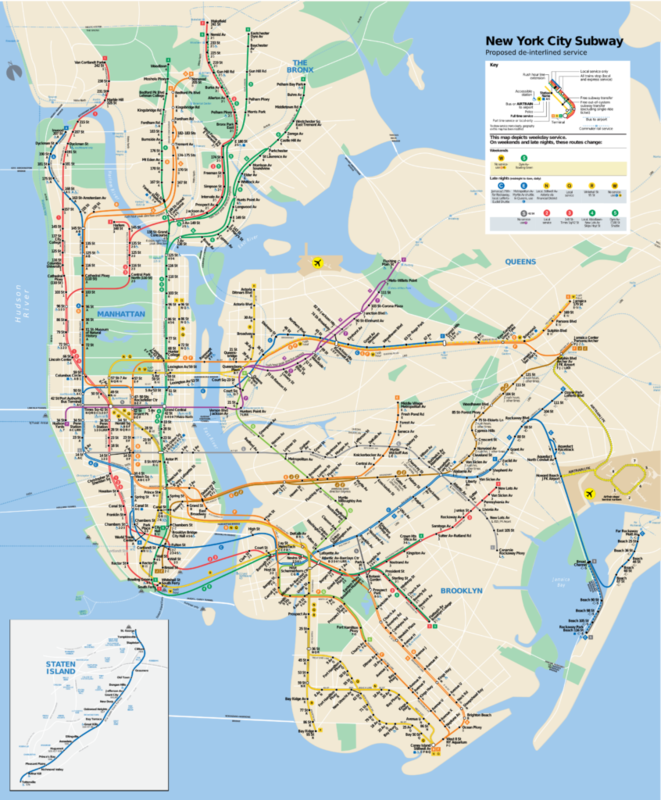 If the B, D, and E never crossed paths with other subway lines, the power outage at 7th Ave/53rd would have never affected the entire subway network. In addition to preventing system meltdowns, Alon’s posts point out that de-interlining allows for simpler scheduling, easier wayfinding, more frequent trains, reduced wear on switches, and reduced bunching of trains. In 2012 the Chicago Department of Transportation commissioned the South Lakefront Corridor Transit Study (“the report”) from 31st to 95th streets in response to very strong community interest in improving transit access, especially along the Metra Electric corridor. The report used dishonest assumptions to pan the idea of rapid transit service on the Metra Electric line, citing high capital and operational costs and low ridership. This post will focus on Section 5 and Appendix A of the report. In my previous post, I explored how complete streets priorities are reversed in 55th Street’s existing streetscape. At a meeting Thursday February 5, 2015, CDOT presented a fiscally unconstrained wish list of proposed streetscape improvements for community feedback. The topics in the comments below roughly follow the order of these slides. Bus tracker data for four of six Chicago’s south Lake Shore Drive express bus routes, the 2, 6, J14, and 28, were collected in November and early December 2014. The J14 Jeffery Jump is branded as a premium bus route with features, such as improved bus station design, peak period dedicated lanes, and transit signal priority. During peak periods, these features allow the J14 delivers reliable service with consistent travel times and limited bus bunching. Travel times on the two miles through the loop are nearly as long as the entire run along Jeffery Boulevard suggesting that the investment in the loop can further significantly improved travel times. On Thursday, I attended CDOT’s second public meeting for a new 55th Street Streetscape Master Plan in Hyde Park. In this first of two posts, I’ll examine existing streetscape conditions on 55th street. Three years ago, 55th Street received a road diet that reduced the barrier the street presents for pedestrians and allowed the installation of protected bicycle lanes. Before this change, 55th Street had not changed significantly since urban renewal when businesses were cleared from the street and it was widened into a fast four lane arterial street. I feel that a master plan for 55th Street should not focus solely on the streetscape but also on land use. The street’s corridor acts as a barrier between the university and the residences and commercial activity in the northern and eastern parts of the neighbourhood and consumes some of the most valuable land on the South Side. However, land use is outside of the scope of CDOT’s plan and tangential to the scope of this blog. Rather than imagining 55th as a blank slate, let’s analyze a redesign of 55th street that improves safety and convenience for existing street users consistent with Chicago’s Complete Streets priorities. Since October, the CTA has been operating two newly purchased battery electric buses. Since early December, I’ve gathered bus tracker data on the six routes that these buses are initially operating on: 7 – Harrison, 120 – Ogilvie/Streeterville Express, 121 Union Station/Streeterville Express, 124 – Navy Pier, 125 – Water Tower Express, and 157 – Streeterville/Taylor. I’ve also tracked some major north-south bus routes on the south side that I will comment on in a future post. As before, plots of the bus tracker data are available here. I’ve also added zipped csv files of the plotted position and speed data. The electric buses, buses 700 and 701, have been replacing diesel buses on up to two peak-hour tripper runs per day each. Each run lasts between two and four hours and up to 35 miles. In the mornings, the buses have either taken run number 52 of route 157 inbound switching to route 121 at Union then the 120 in Streeterville, or they’ve taken run 54 of route 120, switching to route 121 in Streeterville, then route 124 for a round trip. In the afternoons, they’ve taken run 3 of routes 7, 125, and 121, or run 2 of route 7. On my plots of these routes, diesel buses are in red and electric buses in blue. Public meetings about the siting of an Obama Presidential Library on the south side have captured headlines this week: DNAinfo, Chicago Tribune Hyde Park Herald, Chicago Tonight, The Economist, … I attended and testified at the Parks Board meeting at Hyde Park High School this last Tuesday. Nearly everyone in attendance was for “bringing it on home”, albeit with some reservations about ensuring community benefits, and some opponents solidly against using any park land for the library or any loss of open space. Snow wreaks havoc with transportation. Entire fleets of plows keep roadways clear and airports open. Most snowy cities in North America, including Chicago, require residents to clear the sidewalks in front of their homes and businesses. There are many more linear feet of sidewalks than there are roads in the city and they are thus more expensive and slower for city workers to clear. 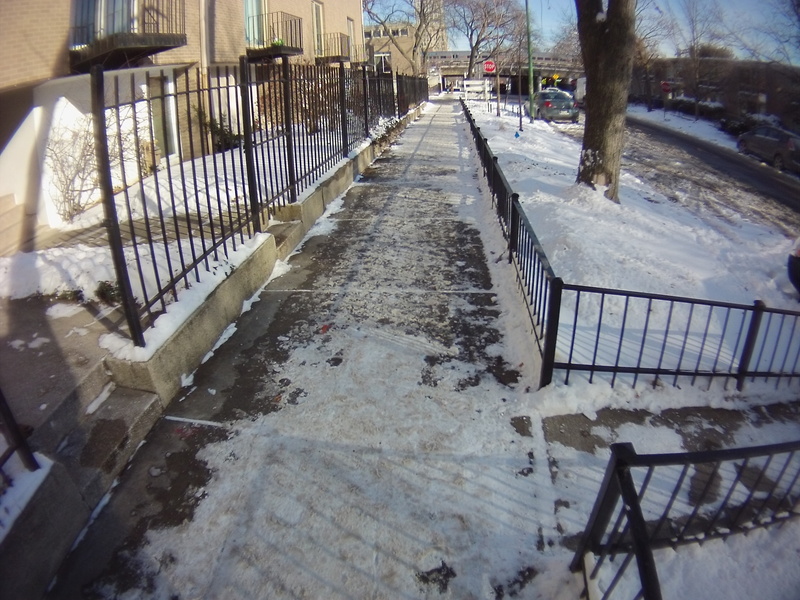 In Chicago, compliance with the sidewalk clearing bylaw is low. On a walk through Hyde Park earlier today, I noted 80% compliance (23 out of 31) with the snow removal bylaw from businesses, rental buildings, and multi-floor condominiums, and less than 30% compliance (20 out of 73) from private residences. I considered a sidewalk cleared of snow if there was no packed snow. I allowed loose snow carried or blown in. I considered the sidewalk in the middle of this image cleared. Packed snow on either side of this segment was not considered cleared.